As one of the premier wedding venues in the northwest there may some function noise over weekends. Superbly refurbished throughout, Liverpool's BEST WESTERN Hallmark Liverpool Alicia is located five minutes from the city centre. 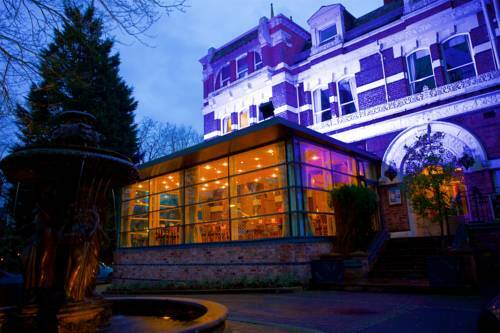 However, a stay here will see you enjoy peace and quiet in a tranquil location that overlooks picturesque Sefton Park. The Albert Dock, Tate Modern and Liverpool One are all within easy reach too. However, the delightful Glasshouse Restaurant, Edwardian Bar and in-room entertainment available from reception may tempt you to stay within the cozy walls of this one-time Edwardian Merchant's house! With ample free parking and friendly staff, the BEST WESTERN Hallmark Liverpool Alicia is ideal for business, pleasure or both! Enjoy your stay. May be restrictions on dining times when functions are on at the hotel. Edwardian Bar: Edwardian Bar, on premises, Bar/Lounge, International, Open for: lunch, Open 11am - midnight. Glass House: Glass House, on premises, Full Service, Steak House, Open for: breakfast, lunch, dinner, 6:30 a.m. to 9:00 p.m., European cuisine. ·From: M62. Take M62 onto A5058, continue for two miles, go straight through the lights into Sefton Park. Take second exit off roundabout. The BEST WESTERN Hallmark Liverpool Alicia will be on the left. Beatles Museum,3.00 mile(s) from Beatles Museum, Experience a full guided tour of the Beatles museum, experiencing the music and the history of the Beatles. Cathedrals,3.00 mile(s) from Cathedrals, two magnificient cathedrals are open to the public and offer tours. Liverpool One,3.00 mile(s) from Liverpool One, Liverpool's brand new shopping experience, situated opposite the famous Albert Dock. Complete with all the famous branded shopping stores full of the lastest fashions we are sure you will have a great day out.